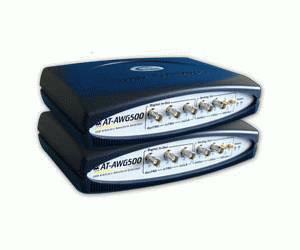 The AT-AWG500 is a high performance 500 MHz, 16 bit fully arbitrary waveform generator. With its powerful parallel architecture, the AT-AWG500 digital engine can perform complex runtime signal processing and waveform sequencing at high speed rates and resolution. The digital engine is well supported by a powerful analog front-end, which provides three outputs with different performance and analog signal conditioning options. The AT-AWG500 parallel digital engine can run in Arbitrary, DDS (Direct Digital Synthesis) and True Arb (with external clock) Mode at a 500 MHz update rate and in 16 bit resolution. The AT-XSS (Extended Synchronous System) expansion system provides up to 8 synchronous outputs without any loss in performance: 8 channels at 500MS/s.